The Buddha Spa by Clarins at La Bagnaia Golf & Spa Resort Siena, Curio Collection by Hilton offers a tranquil, peaceful environment. Decorated with classical columns and antique vases, this space promotes well-being from the moment guests walk through the entrance. This exclusive wellness center is where guests can disconnect, reconnect, and re-energize. 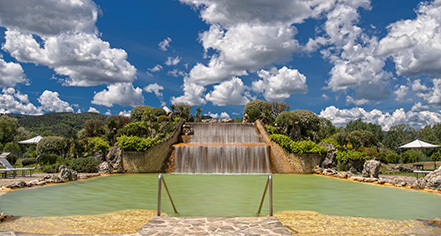 In ancient times, people visited the thermal spring, Santa Caterina, for its healing benefits from the high level of natural minerals in the waters. Those therapeutic waters make up the outdoor thermal pool at the Buddha Spa, where guests can refresh and relax. The pool also features a 13 foot waterfall. 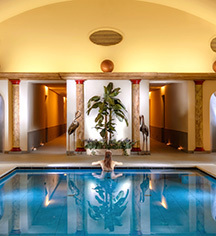 The spa contains a sauna room, steam room, heated indoor pool, and Jacuzzi. Some of the treatments include hot stone massage, invigorating body scrubs, and laminating facials, which can be experienced in private treatment rooms. There is also a contemporary Technogym fitness room, with state of the art equipment, as well as private changing rooms. The fitness facility is complimentary for all hotel guests.